Access globalX goes to Costa Rica! Costa Rica, with its coastline, mountains, and rainforest, is a beautiful place to spend your time. What about spending your sweat, your work, and your heart there as well? How could doing hard things be the “greatest thing” to do? Knowing the purpose behind the work changes everything. The Access globalX team was hosted by 6:8 Ministries. 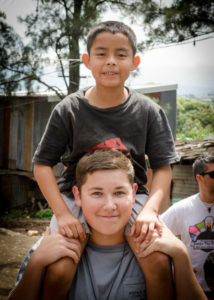 The work 6:8 does in Costa Rica centers around two locations: the rural Living Waters Children’s Ranch, surrounded by rainforest, and the Team House deep in the city of San Jose. Though very different settings, the heartbeat behind each is the same: connecting people to Jesus. At the ranch, missionary couples adopt children in need and raise them to know God’s story and His love, surrounded by a community of other families doing the same thing. Currently one home is finished, and nine more are to be built. The Access team helped clear and fence a pasture for goats and the cow Access is purchasing to provide for the families living there. The team also helped the 6:8 staff make their community center, El Pozo, in the nearby village, an inviting place for connection with local kids and their families. 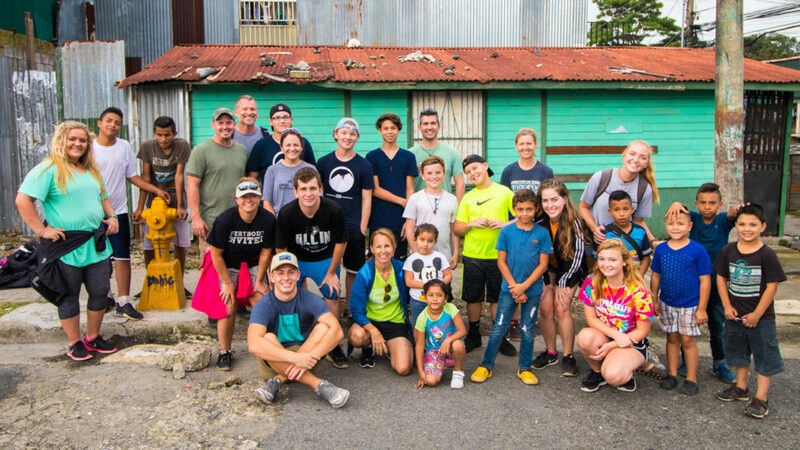 In San Jose, “the New York City of Central America,” the team helped 6:8 and local churches continue to build relationships in neighborhoods of corrugated metal homes, where many families live as refugees and struggle to find work. 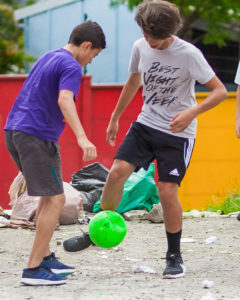 Here, amid trash, sewage in the gutters, and the realities of poverty, children play in the streets, and local churches continue to do whatever they can to offer a message of hope. In one of the toughest neighborhoods, the Access team was part of a Saturday-morning feeding center, where kids experience God’s love for them through the provision of a meal, singing, and Bible stories with people who are there for them every week. “Singing with those kids and seeing their openness and excitement about God was a definite highlight for all of us,” said one of the leaders. Throughout the week the Access team visited four different neighborhoods, carrying in bags of food and a backpack full of bubbles, jump ropes, coloring books, nail polish, and a soccer ball. They crowded into tiny homes and prayed for families, delivered food, and emptied the backpacks, playing with the kids in the streets, getting beat at soccer, and coloring on the concrete. One team member spent the afternoon turning the jump rope for kids lined up to play. When you see that painting a little girl’s fingernails on a dirty street corner is an opportunity, no matter the language barrier, to communicate to her that she is beautiful and loved by God, it becomes a joy. When you know the fence post hole you are digging will help a child grow in safety and the knowledge of God’s love, it becomes more than putting a shovel in the dirt. What kind of impact will be made by one child’s life changed? What kind of impact could these children, raised in a community of faith, grow to have on the city and the needs there? This perspective changes everything. “I even found myself looking forward to the cold showers!” said one team member. God does big things, changing others and changing us, through simple acts of loving service. Things that seem hard or small at first, become great and even fun! If you’re interested in giving your time and energy to serve, you don’t want to miss the opportunity to join us on a globalX trip. Access is going back to Costa Rica in June 2018. Check out our globalX page to learn more about globalX and 6:8 Ministries and to complete an interest form.